I first went to the city of Santa Barbara mostly to use it as a gateway to the Santa Ynez valley and its wonderful Pinot Noir. Though I wanted to see the city itself as well, it wasn’t as alluring to me as the region’s wine country. One day in Santa Barbara was all it took to make me fall in deep, deep infatuation with the city and it’s now one of my favorite weekend getaways. I love it so much I even got married there. Here are my favorite things to do when visiting Santa Barbara just for a day. Santa Barbara is located about 90 minutes north of Los Angeles (or can be much longer depending on LA traffic) along a curving coastline. It’s situated in a valley, resulting in striking scenery no matter where you are in the city. The ocean is on one side; green rolling hills on the other. Santa Barbara is blessed to have a climate similar to its SoCal neighbor as opposed to foggy northern California. Usually sunny, it’s a prime place to enjoy the wonderful California outdoors. 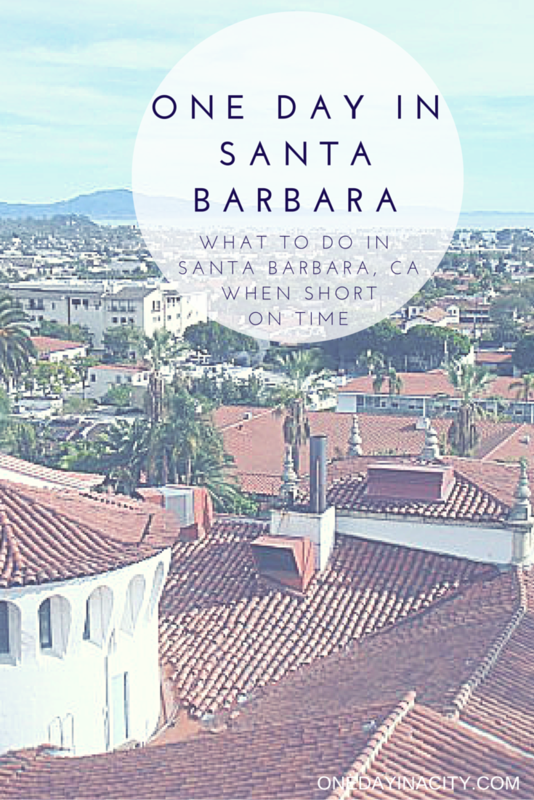 Here are my top tips for what to do with one day in Santa Barbara. Santa Barbara has one of those stretches of sand that is alluring no matter what time of year it is. In summer, it’s of course perfect for lounging on the sand in a bikini, but in winter I find it even more hypnotic. The beach is uncluttered and the vast amount of open sand and curve in the horizon to the north makes me want to skip up and down the sand with my arms wide open. (Which I have succumbed to.) It’s a terrific beach to walk down and also great for watching sunsets. 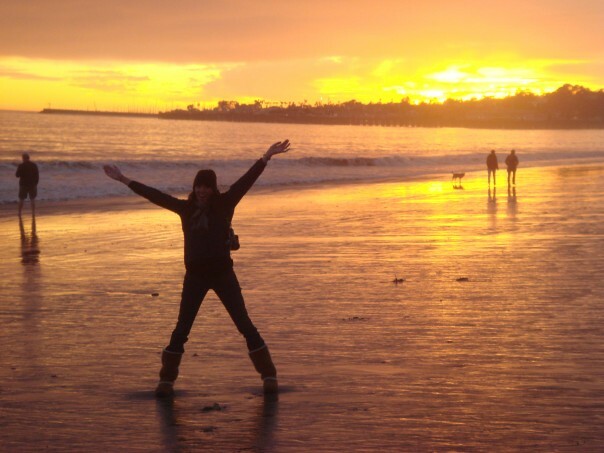 One Day in Santa Barbara must include time at the stunning Santa Barbara beach. One of the really special things about Santa Barbara that a lot of people don’t know is that it has a really good public transportation system that is cheap. Compared to L.A. where it is pretty near impossible to get around without a car, Santa Barbara is a welcome haven from gas-guzzlers. Santa Barbara has shuttles running up and down State Street and Cabrillo Blvd. until 6pm – and until 9pm on Fridays and Saturday from April – October. Best of all, shuttle tickets are only 25 cents. My most favorite activity when I have a day to spend in Santa Barbara is to rent a bicycle and ride along the boardwalk and State Street, plus all the oh-so-cute side streets off of State Street. If you’re feeling romantic – or in my opinion, adventurous, as they are not so easy to maneuver – rent a bicycle built for two. Yes, safety first with me. But I was wise to wear the helmet. Did you know the back rider has NO control over a tandem bicycle? None. And Tom is a crazy bike rider. I almost lost my flip-flops! 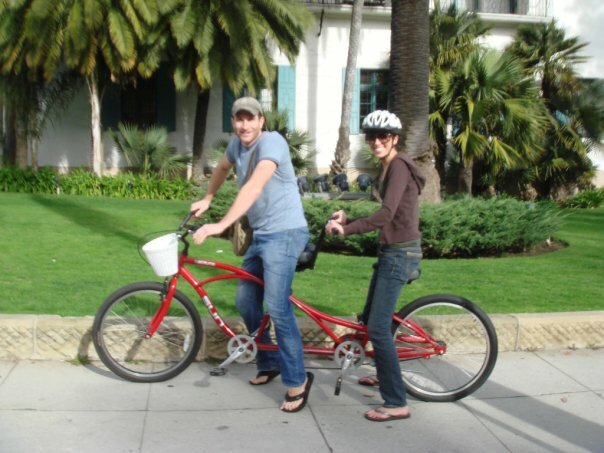 To rent a bike, check out Wheel Fun Rentals on Cabrillo Boulevard. 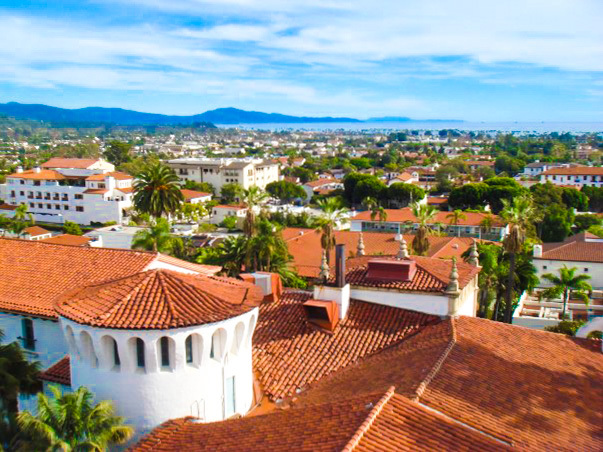 While riding your bike around town, check out the stately and historic Santa Barbara Courthouse. You can chain up your bike to a nearby tree and take an elevator to the top of the Courthouse clock tower for terrific views of the city. View from the clock tower of the Courthouse in Santa Barbara. Bouchon: This intimate restaurant is a dinner investment worth splurging on. Using almost all locally grown food and boasting a selective wine list of the region’s top vintages, Bouchon puts an emphasis on cuisine – which in this case, is fresh, inventive, perfectly cooked, gourmet masterpieces. Reservations are usually a must. Boathouse at Hendry’s Beach: Bordering a thin, rocky area of Santa Barbara’s beach, this restaurant is literally steps from ocean and serves up amazing seafood. Be prepared to wait for the popular patio, though a table by the large windows inside if you’re in a hurry can still give you a beachy ambiance as they open up, letting in the ocean breeze. McConnell’s Fine Ice Cream: Ok, so this isn’t really a meal (though I see no reason why it shouldn’t be), however, whether you visit for a snack or to have ice cream for lunch, this little shop’s ice cream is creamy amazingness and is as famous in this region of California as the many celebrities who have visited it – noted by their pictures on the wall. After dinner, head to Joe’s on State Street – rumored to have the stiffest drinks in town. (I can’t confirm this as hard alcohol scares me, but Tom had a couple and he confirms. I can confirm Tom was drunk.) For some cocktails, a few bars down is Blush, which has a great patio with couch seating and dreamy lighting. Oh, wait, that’s night drinking. I skipped a very important part of visiting Santa Barbara. Day drinking – as in wine drinking. This is after all a city smack dab in the middle of wine country. The best place to experience the wines of the valley in Santa Barbara? The Urban Wine Trail. After you drop off your bike – DUI’s on bikes is a real thing – head to Anacapa Street, about a 15 minute walk from the intersection of Cabrillo Boulevard and State Street. The Urban Wine Trail is home to a number of tasting rooms serving reds and whites from the region, most open from 10am – 6pm, though hours can vary. My favorites are the airy Oreana and funky Municipal Winemakers. If you don’t make it to the Urban Wine Trail in time, don’t despair – you’re in wine country – and can find an amazing vintage of the best Pinot Noir around (that’s a big hint there — don’t leave without sampling the Santa Ynez Valley’s prestigious Pinot Noir) at most bars or restaurants. Sip up and enjoy the laidback, upscale town that is Santa Barbara. The Hyatt Centric Santa Barbara is where I stayed on my first trip to Santa Barbara (though back then it was the Mar Monte Hotel) and where I stayed for my mini-destination wedding, so it holds a special place in my heart and exceeded my expectations under both managements. The property is located right across from the beach and has comfortable, spacious rooms with an onsite bar and spa plus a relaxing pool area overlooking the ocean. The Motel 6 Santa Barbara – Beach was was another hotel we blocked rooms at for our wedding weekend in order to give guests a more affordable alternative. Yes, it’s a Motel 6 so not too exciting, but it’s also located across the street from the beach and our friends and family who stayed there were satisfied with their stay. Or search for Santa Barbara hotels using one of my favorite accommodation booking sites, Booking.com. It’s a really user-friendly set-up, has the lowest pricing, and you can book now and not pay until you arrive for most rooms. 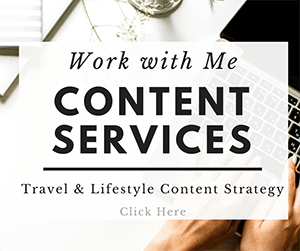 (Note: this is an affiliate link, which means I get paid a percentage of any purchases made through this links at no extra cost to you, which helps me cover the costs of running this site. I only link to brands and products I use and like. Thanks for supporting One Day in a City! Did you find this article helpful? Pin it to read again later! Thanks so much, I found this really helpful for my up coming first time visit to Santa Barbara. Hi Dani, glad you found it helpful! Have fun in Santa Barbara; it’s one of my favorite cities. AWESOME! Thanks for this 🙂 and great name ;)!! Haha, agree, great name. 🙂 Glad you found the post helpful!